The statue which faces the Menai Strait here may look like a product of the British euphoria and mourning after Lord Nelson met his heroic death at the Battle of Trafalgar in 1805. However, the statue was erected much later, in 1873, by an artist experimenting with concrete. It was also a useful landmark for mariners. Art lover and sculptor Lord Clarence Paget, a former Lord of the Admiralty, lived at Plas Llanfair, up the slope behind the statue. He had used concrete to make statues for his grounds and noticed they were more durable than marble in this exposed area. He found that concrete was much cheaper than marble, bronze or stone and could be manipulated easily. 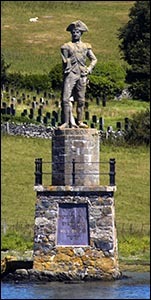 The Admiralty happened to be surveying the Menai Strait at the time, and Lord Clarence accepted its suggestion that, with only a small alteration to the statue’s planned location, the artwork would serve as a navigation aid for mariners travelling in either direction along this difficult stretch of water. Portland cement and iron for the internal framework were donated by suppliers. At the unveiling ceremony in September 1873, Lord Clarence acknowledged the help he’d received in creating the statue from a “faithful and patient Welshman named John Jones”. The Admiralty had already marked the statue on its newest chart by the time of the ceremony. Lord Nelson became a British celebrity after leading the Royal Navy’s defeat of the French at the Battle of the Nile in 1798. Shortly before his final battle against the French at Trafalgar, he used coloured flags on his ship HMS Victory to send a message to the whole fleet: “England expects that every man will do his duty.” The same words are inscribed on the base of the statue, facing the Strait.